We’d love your help. Let us know what’s wrong with this preview of Pup by Christopher Slater. Equal pa This is not the story of a hero. To ask other readers questions about Pup, please sign up. Ever read so many books that you lose track? About a month ago, I saw Christopher Slater's debut novel, Pup, on my Kindle and I started reading it. It grabbed me immediately, but I also had zero recollection of having requested it from NetGalley. It turns out that I didn't request it. I had requested a different book published by The Story Plant, but there was a mix-up with the downloads on Netgalley. I wrote to both NetGalley and The Story Plant to resolve the issue. I received a very kind email Ever read so many books that you lose track? I received a very kind email response from Lou Aronica (President and Publisher of The Story Plant), who not only sent me a copy of the story that I should have received, but who approved my request to officially review Pup, since I was already enjoying it so much. It was a happy mix-up. Thanks Lou! 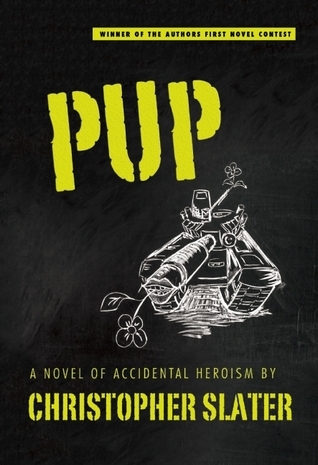 PLOT - Pup is narrated in first person by John Z. Pupulowinazowski (Pup), a college-aged kid who is drafted to fight in the second Korean War, which presumably occurs in our near future. Pup retells his war adventure to his children in a style that's a bit like the sitcom How I Met Your Mother. This is a story of unlikely heroism, dumb luck and unexpected romance. LIKE- The strongest element of Slater's story is Pup's voice. He is a hilarious commentator of the world around him. It's never explicitly stated, but it's inferred that Pup might be mildly autistic. He is task oriented and lacks the ability to read the social cues of others. His situational "dumb luck" is reminiscent of Forrest Gump. Pup is constantly getting himself into a pickle that he manages to escape in the most unlikely way. It's not realistic, but it works in the realm of this story world. I enjoyed the transformation of the fellow soldiers, who went from picking on Pup, to valuing his friendship. Pup is such a darn likeable and innocent character ( I mean his nickname is Pup for goodness sakes, who doesn't like puppies?) that the likeablity drives the story. I kept wanting to read to make sure that he would be okay. He has a sweet romance with a Japanese woman named Mayumi, who is only slightly less of a disaster than Pup. It's a perfect match. DISLIKE- I would have liked more context for the war. There is some background information, when Pup is put on the spot in front of the troops and is asked to explain why he thinks that they're fighting. Still though, I didn't feel like it was enough to satisfy my curiosity. This is a minor complaint in an otherwise wonderful debut. RECOMMEND- Yes! Pup is such a fun read and I look forward to Slater's next novel. Give this strong debut a spot on your bookshelf. I can say it almost feels like a Forrest Gump story, of a young man PU Sometimes a great novel can be summed by the extraordinary gift of storytelling by a talented writer. One that simply makes you forget your reading a book, but makes you feel like you stepped into real life. For me, that is simply, Christopher Slater and his novel, PUP: A Novel of Accidental Heroism. He was the winner of the authors first novel contest and after reading this book, you'll know with certainty why it was chosen. I can say it almost feels like a Forrest Gump story, of a young man PUP who has just graduated high school and has his future set on college. Knowing the Second Korean War has begun along with the draft he feels confident that he will not see combat based on his ability to have someone take one look at him for a likely candidate to be drafted and simply look the other way. But that is not what happens. In fact, PUP finds himself heading toward the South Sea along with many other soldiers who have begun to join the fight, but for the life of him, can't understand why he has been chosen, while many of the others have been chosen based on their ability to bench press most of the weights in a gym, PUP resembles the bar alone. Not to mention that he is prone to motion sickness, and takes just about everything on the market for it. He didn't plan on it making him nauseous and gains him an immediate dislike by a muscle bound soldier who insist that if PUP is going to throw up, he is going to rip off his nose and eat it. He later learns that this man is his squad leader with the nickname Hannibal. Wonder why? Adorable puppy of a protagonist - naive, clumsy yet smart as a whippet! This is a narrator that you instantly connect with - a little like Adorable puppy of a protagonist - naive, clumsy yet smart as a whippet! This is a narrator that you instantly connect with - a little like Don Tillman in The Rosie Project, Pup (the nickname he gains on joining the army) is both incredibly intelligent but also insanely, frustratingly incapable. He may have the causes of the War down pat, but can he go five minutes without a mishap occurring? Think again. Pup talks to us, or rather, his family through his story, so we know from the start he will survive the war. He relates his drafting, training and then his tour of duty. As the new guy, his unit hardly know what to make of him, though as the New Guy, he gets the treatment you would expect from Hollywood movies. His unique skill-set may provide him with a way of coping with and even excelling in certain elements of warfare. I really don't want to spoil anything by giving details, it's just too funny to read knowing what's going to happen. And while it's funny, there are of course, injuries and deaths - it is war after all. There are some scenes that reminded me of Forrest Gump (and indeed Pup himself has traits that hark back to this famous fictional hero). Pup makes a superbly entertaining narrator. He KNOWS he's not the average soldier, he KNOWS he can't behave the way others do, but he is also just himself. "I had just wanted to make certain that my chemistry teacher wasn't exaggerating about how some chemicals reacted with each other... It took a month for my eyebrows to grow back. The chemistry teacher's toupee didn't make it." "Not since the time I had gotten lost in the mall had I ever felt so alone. At least at the mall I didn't have people trying to kill me. Not that I knew." We also get some nicely-rounded characters in Pup's unit, both male and female, and get a glimpse at 'modern' warfare in the contemporary world where this imaginary war (though possibly based on real ones) is taking place. There's even a.. wait for it... love interest! This may not be a Catch-22 war story, or even the darkly humorous Fobbit, but if you want a Rosie Project meets Forrest Gump, this could be the book you're looking for. Run Pup, run!! Pup is a great read written like a comedy movie that would have you laughing for the entire show. Pros: Pup is written in a way that invites you into his life as a guest you may not understand why he does what he does (and sometimes Pup doesn’t either) but he does his best to make you understand. The book develops the characters well from Pup himself to the mysterious Boom, you will see how they grow throughout the story to become friends who would risk life and limb for each other. The author mi Pup is a great read written like a comedy movie that would have you laughing for the entire show. Pros: Pup is written in a way that invites you into his life as a guest you may not understand why he does what he does (and sometimes Pup doesn’t either) but he does his best to make you understand. The book develops the characters well from Pup himself to the mysterious Boom, you will see how they grow throughout the story to become friends who would risk life and limb for each other. The author mixes military action with comedy, romance and even more comedy to make for a good read that you will enjoy throughout. Cons: My first con with the book was the font, it was written in a font I was not familiar with and it was a little hard for me to read until I got used to it but after a while it got easier. I would actually take off a half star just for the font if this was an option it was so distracting to me when I began the book. The only “writing” con I could find was that some of the comedy is pretty “slap stick” and is like reading an old Chevy Chase routine. Not that it isn’t funny but you have to realize Pup isn’t a normal person so some of the things that happen to him are just a little too crazy sometimes. All in all I would say Pup is a great read that would be enjoyed by anyone who likes a book about someone who is in over his head every day of his life and still manages to get by. It may even make you feel better about your day, I mean hey, at least you are not Pup. I thoroughly enjoyed the story of Pup. It was clever, unique, hilarious and sorrowful! I thought Pup might remind of Gomer Pyle, but it never did. Rather I found myself feeling like his mother, saddened by a fact that he would no longer be my boy, but a man when he returned home. I loved that the writing seemed self depricating and very tongue in cheek. My favorite part was the airport scene when he first left for Korea. The author depicted a gangly, awkward teenager who seemed to do everything i I thoroughly enjoyed the story of Pup. It was clever, unique, hilarious and sorrowful! I thought Pup might remind of Gomer Pyle, but it never did. Rather I found myself feeling like his mother, saddened by a fact that he would no longer be my boy, but a man when he returned home. I loved that the writing seemed self depricating and very tongue in cheek. My favorite part was the airport scene when he first left for Korea. The author depicted a gangly, awkward teenager who seemed to do everything incorrectly and embarrass himself in so doing. However this young man also realized his clumsiness and acjnowledged it. You know the saying, "It is what it is?" This fits a description of this story to a T.
Slater often speaks to Pups children as they are reading this book and I found that to be endearing and all a part of Pup's wonderful personna! Then I was gripped and found some real laugh out loud moments. Sorry, did not like it. Was this for teens?